As we head into summer weather, the area lakes will be dotted with Jet Skis and Sea-Doos, which have become very popular in the last few years. Dale Hollow lake will see its share of this type of sport again this summer, but it once saw another type of boat on its waters. 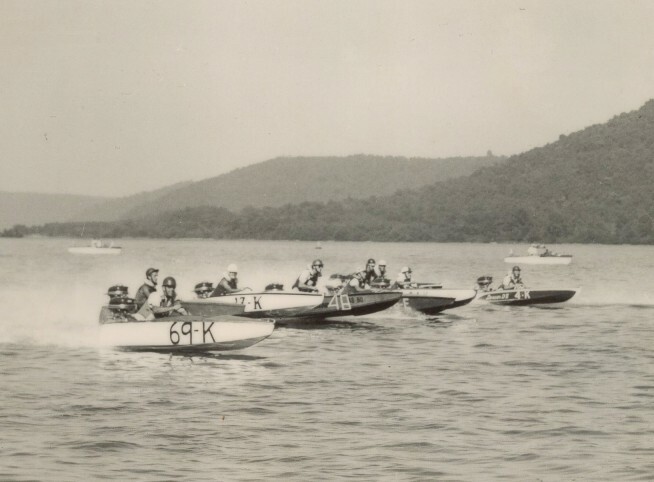 It was during the late 1940s and early 1950s, that a group of Livingston businessmen got together on Sunday afternoons on Dale Hollow lake to race what were called stock utility racing boats. When this group first began to race, none of the men even owned a stock utility boat, that came later. They started out with ordinary fishing boats and a makeshift track using big, black inner tubes that were anchored out in the lake to outline the course. The site of their first track was in front of the boat dock the Harrison's owned, known as Sunset Dock. 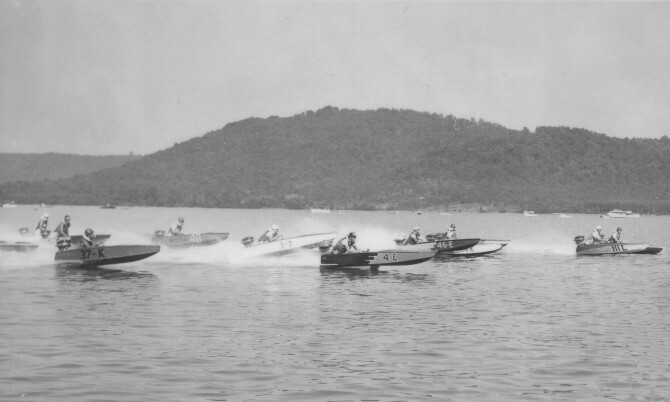 These two pictures were taken during a race in Guntersville, AL, in 1951. Among the contestants were Raymond McCormick, No. 69-K; Bill Winningham, No. 37-K; and Dr. H.B. Nevans, No. 17-K. The letter "K" was assigned to all boats from Tennessee. Members of this group included Bill Bussell, Dr. C.N. Eley, Verlin Hyder, Dr. H.B. Nevans, Aubrey McCormick, Raymond McCormick, Osby Story, and Gradis Winningham. After word got out that this type of racing was taking place on Sunday afternoons on Dale Hollow, folks lined up on the banks of the lake to watch. These events were sometimes held up by baptismal services taking place near the Obey River bridge. During those times, the races were stopped until the baptizing service was finished. The fishing boats this group of men first started with had no steering wheels. The boats were guided by using a bar or handle attached to the motor of the boat. A fellow from Byrdstown by the name of Toots Hassler was the first to rig up a steering wheel in the boat he used when he raced with this group. It was also around this same time that the first skiers could be seen on the lake. Two young men from Livingston, William Meredith Nevans and Bill Winningham, were the first to ski in the area of the Byrdstown bridge. Water skis could not be purchased any closer than Nashville at that time, and these two fellows made a special trip there to get a pair. They had a wooden handle made for the rope used to ski with. 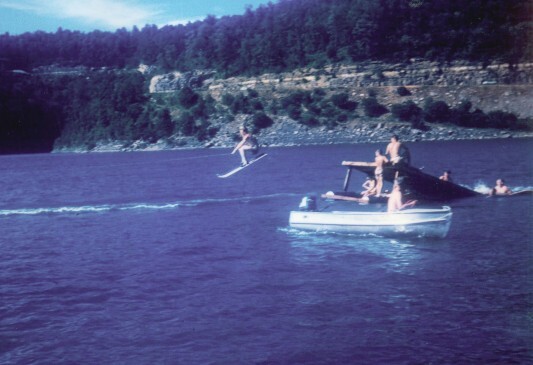 As time went on and their skiing skills began to improve, a group of young men decided to build a ramp out in the lake near the Obey River bridge. Those in that group were Tom Davis, Sam and James Kuykendall, Gene Smith, William Meredith Nevans, and Bill Winningham. The ski jump constructed around 1951 near Obey River bridge was a big hit and a lot of fun for those who dared to take the plunge. Young ladies around Livingston also began to participate in the sport of water skiing. Maxine McCormick and her younger sister, Reba McCormick Crabtree, were the first young ladies to ski on that area of the lake. Observers on the banks were entertained by those who skied and also by those who jumped the homemade ski ramp on lots of Sunday afternoons spent on Dale Hollow Lake. As interest in boat racing increased, Gradis Winningham, who was the owner of a hardware store on the square in Livingston at that time, ordered four sport utility racing boats through his store. One of the boats he kept for his use, and the others were sold to other members of the group. A top speed of 45 mph, which was considered really good, was made possible by using a Mercury Super 10 Hurricane motor. This group began to expand their racing by going to events held on Center Hill Lake; Old Hickory Lake; Lake Tansi in Crossville; the Tennessee River in Chattanooga; Fort Loudoun Lake in Knoxville; Guntersville, AL; and Jacksonville, FL. Some of their members also attended the national championship held in July 1951 in Dallas, TX. Betty Jo Story has written some of her memories of that trip as follows: “The National Championship boat races was held in Dallas, TX, in July 1951. The men that entered the races were Gradis Winningham, Dr. H.B. Nevans, Osby Story, and Verlin Hyder. Their wives went along on the trip to Dallas to help cheer them on. “Carson and Betty Jo Story and Bill Winningham enjoyed making the trip, too. Carson helped drive the pickup truck that carried or pulled three boats. “The group left on Friday about noon. We drove to Arkansas and kept looking for a motel to spend the night. All the signs said “no vacancy”. We drove on till about midnight and finally found a cheap motel. “We went to a restaurant to get something to eat. They seated us at a big, long table. Everyone ordered a plate lunch. I ordered my plate with buttermilk. When I pulled the lid off the glass bottle, it spewed on Carson and myself. Carson said, ‘You always have to be different.’ But I thought we needed a little fun, too. “Mrs. Winningham said she would wrap a piece of chicken for Bill and put it on the floor by his bed. She said sometimes he gets hungry during the night. The next morning, Mrs. Winningham saw a scorpion in his room. The chicken was gone. They thought maybe the scorpion ate the chicken. “Osby, Irene, Carson, and I got a room with two double beds. That’s all they had left. It had a pull curtain between us. “Carson and I would snigger every time he said that. He never did tell the waitresses any different. “The new nylon crinkle drip-dry shirts for men had just come out on the market. I remember Verlin Hyder was wearing one of the new shirts. You could wear it one day and wash it that night and put it on a hanger to dry and wear it the next day. No ironing needed. When they were boat racing, Verlin got his clothes all wet. A boat got too close and sprayed water all over him. His suitcase was back at the motel in Dallas. Carson had an extra pair of blue dress pants and a shirt in his suitcase. We loaned them to Verlin to wear. “It was real hot that day, but nobody said anything about the heat. We were proud to be there to enjoy the boat races. “Some of the men from Livingston got a trophy, and I believe Osby was one of them. “We left the motel early the next morning on the way home. We met Roy and Edith Smith somewhere as we were returning home. We stopped and got out and talked to them a while. I was 23 years-old and that was the first time I had ever been out of the state of Tennessee. Bill Winningham, left, accompanied by mechanic Chapin McCormick, prepares for a boat race on Fort Loudon Lake in Knoxville in 1951. Winningham was the youngest competitor in the race. It was while this group was on their trip to Dallas that Bill Winningham saw his first television. He was 15 years-old at the time. 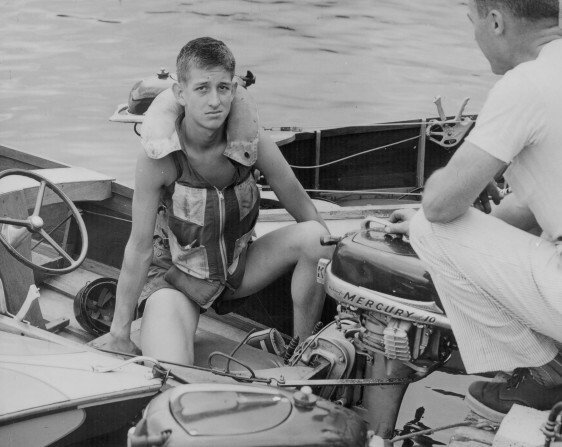 Bill was the youngest competitor in the Fort Loudoun Lake race held in Knoxville in 1951, and was the recipient of several trophies during the time he and his father were racing. His father, Gradis, came in fourth place at the November 1950 APBA National Utility Outboard Championship in the Class BU category, an event that was also held in Dallas. His speed that day was listed as 31.003 mph. 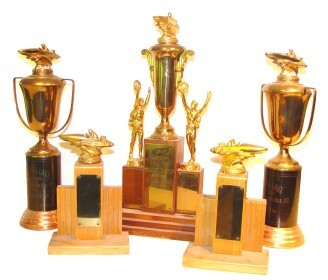 Osby Story brought several trophies home from the trips made to Guntersville, AL. A couple of the men in the group often took along drivers for their boats who included Bill Wilborn and Ed Cope. My father, Chapin McCormick, went along on some of the trips, too, as a mechanic for Dr. H.B. Nevans. This type of sport was a short-lived one in that it only lasted from the late ‘40s until around 1952. No doubt this type of boat would be left far behind with those sporty water crafts of every size and description we see on the lakes today. But can you imagine how much interest and excitement Bill Winningham could create if he could bring back his 37-K to Dale Hollow lake on a Sunday afternoon? It would be almost as good as winning all those trophies he took home during the time stock utility boat racing was in its heyday, a time those of us who are over 50 remember fondly.